(Vatican Radio) Pope Francis has sent a Message to the heads of the Group of 20 nations, who are gathered in Hamburg, Germany from July 7-8. Addressed directly to German Chancellor Angela Merkel, the Message details four principles of action, which the Holy Father offers as guides for the building of fraternal, just and peaceful societies: time is greater than space; unity prevails over conflict; realities are more important than ideas; and the whole is greater than the part. Pope Francis expresses the hope that those four principles – drawn from his Apostolic Exhortation, Evangelii gaudium – might also serve as an aid to reflection for the Hamburg meeting and for the assessment of its outcome. The Holy Father’s reflections touch on several pressing issues, including the ongoing migration crisis. “In the minds and hearts of government leaders, and at every phase of the enactment of political measures, there is a need to give absolute priority to the poor, refugees, the suffering, evacuees and the excluded, without distinction of nation, race, religion or culture, and to reject armed conflicts,” Pope Francis writes. (Vatican Radio) Pope Francis has sent a Message to the participants in the G20 meeting taking place in Germany July 7-8. The Message is addressed to the Chancellor of Germany, Angela Merkel, and details what the Holy Father recognizes as four principles of action for the building of fraternal, just and peaceful societies: time is greater than space; unity prevails over conflict; realities are more important than ideas; and the whole is greater than the part. (Vatican Radio) Pope Francis on Friday celebrated Mass for the maintenance staff of Vatican City State, reminding them that our joy and our salvation lies in the fact that Jesus came so that we can all be forgiven our sins. Speaking to a group of Vatican employees who take care of maintenance and general services, the Pope reflected on the Gospel reading of the day which speaks of how Jesus invited Matthew, a tax collector, to dine with him at his house. He illustrated his words recalling a Caravaggio painting “The Calling of St. Matthew” which he said, he used to like going to see when he could walk the streets of Rome freely,before becoming Pope, and he described the scene that features Matthew counting his money, and Jesus pointing at him with his finger as he chooses him to dine at his table. 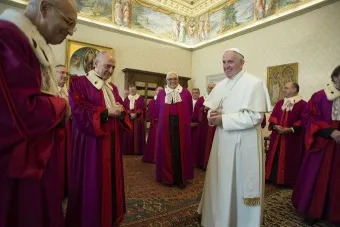 (Vatican Radio) At the request of Pope Francis, the Congregation for Divine Worship and the Discipline of the Sacraments is writing to Diocesan Bishops to remind them that it falls to them above all to duly provide for all that is required for the celebration of the Lord’s Supper. At the request of the Holy Father, Pope Francis, the Congregation for Divine Worship and the Discipline of the Sacraments is writing to Diocesan Bishops (and to those who are their equivalents in law) to remind them that it falls to them above all to duly provide for all that is required for the celebration of the Lord’s Supper (cf. Lk 22: 8,13). It is for the Bishop as principal dispenser of the mysteries of God, moderator, promoter and guardian of the liturgical life in the Church entrusted to his care (Cf. CIC can. 835 § 1), to watch over the quality of the bread and wine to be used at the Eucharist and also those who prepare these materials. In order to be of assistance we recall the existing regulations and offer some practical suggestions. This passage, from the day’s Gospel reading, was the starting point for Pope Francis’ reflections ahead of the Sunday Angelus. Jesus, the Pope said, addresses this invitation to everyone, without exception, who feels weary or burdened by life. “Jesus knows how hard life can be,” he said. He knows how many things can cause our hearts to grow weary. In the face of all these burdens of life, the first word of Jesus’ invitation is “Come.” When things are going badly, Pope Francis said, it is a mistake to remain where we are. Although this might seem evident, he continued, it is natural in moments of darkness to turn in on ourselves, to brood on the injustices of life, the ingratitude of others, or the wickedness of the world. But Jesus wants to pull us out of this “quicksand.” The way out is in the relationship, in reaching out our hand and lifting our gaze toward the one Who truly loves us. Bishop Mario Delpini is to be the new Archbishop of the Archdiocese of Milan succeeding Cardinal Angelo Scola, the Vatican has announced today (7 July). Cardinal Scola, the runner up to Francis in the 2013 conclave, handed in his resignation last November, on reaching the age of 75. He is likely to step down from his position in September, meaning that Bishop Delpini will assume his role as head of Europe’s largest diocese at the start of the new pastoral year. Bishop Delpini - who is known as ‘Don Mario’ - has a very good knowledge of the Milan Archdiocese, a seat known for its prestige and administrative complexity – numbering over 1,100 parishes and around five-and-a-half million faithful. PARIS - Amid ceremonies this year marking the 500th anniversary of the Reformation, one of Protestantism’s leading branches has officially said it now agrees with the Vatican on the main issue at the root of its split from the Roman Catholic Church half a millennium ago. The ceremony took place in Wittenberg, where in 1517 Martin Luther unveiled the 95 Theses that launched the Reformation and with it centuries of dispute about whether eternal salvation comes from faith alone - the position of the new Protestant movement - or if it also requires good works on Earth as Catholics argued. This decision by the WCRC - representing 80 million members of Congregational, Presbyterian, Reformed, United, Uniting and Waldensian churches - marked another step in a gradual but remarkable reconciliation on this issue among Christians who once fought wars and declared each other heretics over just such questions. The World Methodist Council formally endorsed the Catholic-Lutheran accord, known as the Joint Declaration on the Doctrine of Justification, in 2006. The Anglican Communion is expected to do the same later this year. (Vatican Radio) Pope Francis issued an Apostolic Letter motu proprio on Tuesday, by which he created a new category, distinct from martyrdom, under which a Servant of God may be declared Blessed: oblatio vitae, or “the free offering (i.e. “oblation”) of [one’s] life”. Pope Francis opened the possibility of a new way for the processes of Beatification and Canonization: “the offering of life,” which is added to the martyrdom and heroic virtues. Here is our complete translation of the Apostolic Letter in the form of the Motu Proprio “maiorem hac dilectionem,” published on this matter on July 11, 2017. These Christians, who following more closely he steps and teachings of the Lord Jesus, offered voluntarily and freely their life for others and persevered in this intention up to death, are worthy of particular consideration and honour. It is certain that the heroic offering of their life, suggested and sustained by charity, expresses a veritable, full and exemplary imitation of Christ and it is why they merit the admiration that the community of the faithful usually reserves to those who voluntarily accepted the martyrdom of blood or exercised the Christian virtues to a heroic level. The offering of life is a new individual case of the procedure of Beatification and Canonization, distinct from the individual case on martyrdom and on the heroism of virtues. (Vatican Radio) Pope Francis has sent a message to an International Catechetical Symposium which is taking place this week at the Pontifical Catholic University of Argentina in Buenos Aires, and has as its theme “blessed are those who believe”. He goes on to say that the catechist walks with Christ, therefore is not a person who starts from his own ideas and tastes. He or she looks for the Lord and that searching makes their heart burn. (Vatican Radio) Following the 2nd anniversary of the publication of his encyclical “Laudato Sì – On Care of our Common Home”, Pope Francis has endorsed a pledge campaign that aims to mobilize at least 1 million people to directly engage in turning the encyclical’s message into action. Organized and promoted by the Global Catholic Climate Movement, the pledge calls on those who sign to answer the call of Laudato Sì by praying with and for creation, living more simply, and advocating to protect our common home. The "Laudato Sì Pledge campaign" has received support from Church leaders from around the globe including Cardinal Turkson, Cardinal Tagle, Cardinal Ribat, Cardinal Cupich and Cardinal Marx. It has also garnered the support of major environmental leaders. (Vatican Radio) The Holy See Press Office has issued a statement concerning indictments for embezzlement of funds from the Bambino Gesù Foundation, which exists to support the work of the Bambino Gesù Children’s Hospital. The Statement says the former President of the Foundation, Giuseppe Profiti, and the former Treasurer of the same Foundation, Massimo Spina, were summoned to appear before the court to answer charges that they diverted more than four hundred thousand euro (€400,000) belonging to the Foundation. (Vatican Radio) More than one hundred seminary rectors from throughout the English-speaking world gathered in Rome earlier this month under the guidance and sponsorship of the Congregation for Clergy to discuss the revised handbook of best practices for the formation of seminarians. Known as the Ratio fundamentalis institutionis sacerdotalis – ratio fundamentalis or just ratio for short – the latest edition of the document is titled, On the Gift of Priestly Vocation. The basic and animating idea of the Ratio is that of helping seminaries all around the world to succeed in their mission of forming men for the priesthood by first firmly grounding them in a self-conscious attitude of missionary discipleship, and then giving them the tools to live their lives as disciples to the fullest, in and through the ministerial priesthood to which God calls them through His Church. (Vatican Radio) During his Angelus address on Sunday to the pilgrims and tourists who braved the heat in St Peter’s Square, Pope Francis recalled the Gospel reading of the day, the famous parable of the sower. The Holy Father noted that “Jesus performs, so to speak, a "spiritual radiography" of our heart”, which is the ground upon which the seed of the Word falls. Our heart, he added, "is like the soil, it can be good when the Word bears fruit, but it can also be hard, and waterproof." Pope Francis also described how in between these forms of soil, there are two types of land. The first, he said, is a stony ground where the seed cannot put down deep roots. This, the Pope added, “is the superficial heart that welcomes the Lord, wants to pray, love and testify, but does not persevere..."
(Vatican Radio) Pope Francis has sent a Message to the International Meeting of the World Movement of Christian Workers which has been taking place in Ávila, Spain, on the occasion of the 50th anniversary of its foundation. 120 delegates representing the Movement, present today in 79 countries are attending the event. The theme of the meeting is, "Land, Home and Work for a Worthy Life". The message, signed by Cardinal Secretary of State Pietro Parolin, stresses that "the dignity of the person is closely united to these three realities" that remind us that the fundamental experience of the human being "is to feel rooted in the world, in one Family, in a society. " (Vatican Radio) The first hearing by the Vatican tribunal of a case against two former officials of the 'Bambino Gesù' children’s hospital took place on Tuesday. The hospital, Europe’s largest paediatric research centre, is owned by the Vatican and often referred to as ‘the Pope’s hospital’. Former president of the 'Bambino Gesù' foundation, Giuseppe Profiti and former treasurer, Massimo Spina, are charged with illicitly using money to renovate an apartment belonging to Cardinal Tarcisio Bertone, the former Vatican secretary of state. They stand accused of paying over 422.000 euros of hospital funds to Gianantonio Bandera, owner of the Castelli Re construction company. During the morning hearing, tribunal president Paolo Papanti-Pellettier rejected the defence lawyers’ claims that the Vatican has no jurisdiction over activities related to the hospital, which is located on Italian territory. He also rejected a request for journalists to be moved out of the courtroom. The tribunal heard a further objection by Massimo Spina’s lawyer that his client did not have any authority to transfer funds from the hospital foundation, but only to carry out orders from his superiors. In this context, the lawyer quoted a letter from Cardinal Bertone, but did not disclose the contents of the message. ROME - The shake-up at the Vatican’s Congregation for the Doctrine of the Faith continues, as Pope Francis appointed Monsignor Giacomo Morandi to be its second highest-ranking official. The Italian Biblicist had already been chosen by the pope in 2015 to be the undersecretary of the congregation charged with ensuring the coherent and correct interpretation of Catholic theology. The promotion follows the announcement on July 1 that Spanish Archbishop Luis Ladaria Ferrer, the former deputy of the doctrinal congregation appointed by Pope Benedict XVI in 2008, was to be its new prefect. Ferrer replaced the German Cardinal Gerhard Müller, 69, who had taken a more conservative interpretation of Francis’s encyclical Amoris Laetitia concerning divorced and civilly remarried Catholics. Morandi, at the relatively young age of 51, is therefore the pope’s new inside man within the congregation, after serving as a priest in the northern Italian diocese of Modena-Nonantola since 1990. (Vatican Radio) A new report has found that at least 547 young members of the Regensburger Domspatzen boys choir in Germany were subjected to physical and in some cases sexual abuse. The report accuses 49 members of the Church of carrying out the abuse between 1945 and the early 1990s. The lawyer tasked with investigating the abuse Ulrich Weber spoke about the investigation during a press conference in Regensburg. "The fact is this: it is likely that there are almost 550 victims, of these 67 were victims of sexual violence; There are altogether 9 accused of carrying out sexual violence against children... There have been cases of severe physical and sexual violence, which have always been prohibited. Pope Francis greets the judges of the Roman Rota at the Vatican's Clementine Hall Jan. 22, 2016. Credit: L'Osservatore Romano. Vatican City, Jul 20, 2017 / 06:15 am (CNA/EWTN News).- Fr. Pierangelo Pietracatella and Fr. Hans-Peter Fischer are the newest members of the Roman Rota, and mark the latest in a string of appointments Pope Francis has made this summer as part of his ongoing effort to restructure the Roman Curia. Fr. Fischer, a priest of the archdiocese of Freiburg, located in Germany's black forest region, has been named an auditor of the Rota. He is the current rector of the Pontifical Teutonic College of Santa Maria in Campo Santo, located in the Vatican.